What makes a human life worthwhile? Is it our good qualities, like kindness or patience? Or our intelligence and resourcefulness? Or is it, as in Emma Adams’ play, Animals, solely down to our ability to make an economic contribution to society? The year is 2046, and global warming has brought the UK to a state of crisis. With limited resources to go around, capitalism decrees that anyone over 60 must face involuntary euthanasia, unless they’re paid for by their families. And at the other end of the scale, children are now raised with one goal: to make them valuable members of society, so that they’re in a position to support their parents when they reach their ‘diminished years’. In a small, run-down bungalow in Yorkshire live 77-year-old Norma, her 70-year-old neighbour Helen, and the live-in help, Joy, who’s still ‘legal’ (just) at 59. Forced to do whatever they must to survive, no matter how unsavoury, the ladies live in fear of the utilities inspector, who could arrive at any moment with his air syringe to ‘clear’ them. Meanwhile, the inspector, Noah, who’s known throughout most of the play as ‘Daddy’, has other concerns; his 17-year-old daughter Maya is one day from her 18th birthday test, which will determine both their futures, and he’s not convinced she’s got what it takes to make the grade. Inevitably, the five run into each other, and chaos ensues. In director Lisa Cagnacci’s first in-house production at Theatre 503, I was glad to see the three ladies played by actresses of the right age. Marlene Sidaway, Sadie Shimmin and Cara Chase are warm and funny; each of their characters is genuinely likeable. And yet there’s something slightly sinister about the group, and an air of desperation that you feel could, and does, lead them to do anything. In the topsy turvy world of Animals, these three victims of society are portrayed as witches, while their would-be killer is painted as a hero because his activities are acceptable in the eyes of the law. Steve Hansell gives a powerful performance as Noah, a man driven by duty, who sees other humans – including his own daughter – only through his own traffic light system of green, amber or red. And Milly Thomas is particularly memorable as Maya, a child in a teenager’s body, pulling off her wide-eyed innocence and resolute perkiness in a way that makes the character appealing and sympathetic, when she could so easily have just been irritating. Emma Adams’ script is witty and multi-layered, and deserves more than one reading to tease out all the issues and questions raised. Much of its power is in the conflicts created: the scene in which someone who’s about to be killed is offered the chance to pay an extra £10 for religious comfort, for instance, is at once humorous and deeply disturbing. The story moves quickly, for the most part, with Max Dorey’s set allowing the actors to move easily from the interior of the bungalow to the street outside, without a need to pause between scenes. The conclusion is the only part that feels a little slow; after the climactic scene in the bungalow, the final conversations feel ever so slightly laboured and could be wrapped up more quickly than they are. Animals is a dark comedy, with plenty of very funny moments, mostly courtesy of the old ladies’ scandalous exploits. But it’s also a serious examination of important issues. Topical references, such as the mention of zero hour contracts, remind us that this imaginary world might not be so far away from becoming a reality, and force us to confront the ethical dilemma: when resources run short, how do we decide who gets them? Should the financial contribution made by someone now outweigh anything they may have done in the rest of their life, or indeed their other good qualities? Who gets to decide the worth of another human being? These are questions that make you think, and stay with you long after you leave the theatre. 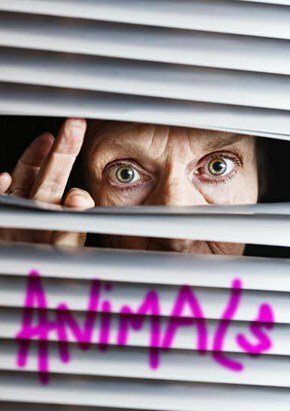 Animals is a wicked satire set in a world where everyone over 60 is tossed on the scrapheap, children are hothoused, and being a “burden on society” is the ultimate crime. Yorkshire-based Emma Adams has been New Writer in Residence at West Yorkshire Playhouse and has also written for Slung Low, Red Ladder, Look Left Look Right and Ovalhouse. Lisa Cagnacci is Associate Artistic Director of Theatre503.